While I had always loved cats and had a couple as a child, I had been so hurt by their passing that I could not get further than thinking about adopting as an adult. Then I had a health scare shortly after returning to Vancouver from a long trip down under, in April 1995, and when it resolved, I immediately decided to adopt a cat! I went to the local shelter and fell in love with a young unneutered black male adult who didn't look quite black. He was a stray from the Tony west side. He talked and talked, stopping only to listen when I spoke back. As soon as I stopped, he would reply. When I asked him if he wanted to come home with me, he flopped onto his back, which seemed like an affirmative to me. Having just spent a good deal of time admiring the native birds of New Zealand, I named him Tui, for his looks and his voice, and because, well, it's just a great name for a cat. Tui would simply not take to being an indoor cat even after neutering, so I grudgingly allowed him out under the best supervision I could offer. Before the end of our first year, I was on my way back to the east coast, car stacked to the ceiling, the front seat cleared for his carrier, and he accompanied me right across Canada and into New England, where he would spend his years variously as rambunctious backwoods cat to country squire to urban Victorian dweller. I never felt alone with Tui, and this would be the pattern for the 20 years less one month that he blessed me. He also made a lot of friends, some of whom were more his than mine. From human cohabitants to neighbors who only met me years later, to friends who came over as much to see him as me, to others who swore they were dog people normally, and even cat sitters who only cared for him for a weekend. I shouldn't forget the half dozen or so feline and canine companions who all loved him over the years. He was never shy, and never held back. He didn't often back down on his demands, which usually involved manipulating someone into sitting down so he could get into their lap and purr away his and their cares. Tui had more than 9 lives, escaping various illnesses and surgeries to emerge as robust as ever, and even stronger in will. Even in the last year or so when he slowly declined, we had many more happy times than sad ones. While I am still aggrieved at our loss, he will always be in my heart, and will continue to enrich me with the memory of his giving and, more importantly, his sharing spirit. Such happy memories; hope another cat chooses you. He was a handsome looking cat. That's a sweet story. Sorry for your loss. Very heart warming and lovely story. 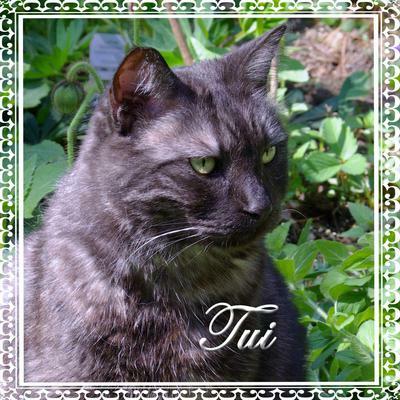 I am glad Tui had a good life with you and was a loving companion. What a special tribute to an obviously very special cat. RIP Tui.